9 February 2016. The SARD-SC project rice component in collaboration with AfricaRice and INRAB have installed energy efficient GEM rice parboiling technologies and innovations in the Malanville Innovation Platform (IP) in the irrigated rice ecology of northern Benin Republic. The formal launch of the Malanvile IP, which attracted almost 1000 women from the nooks and cranny of the country, witnessed the presence of policy makers such as the mayors of Malanville and Gaya, Niger. It also provided additional policy incentive to the operationalization of the IP. To efficiently use and manage the Grain quality Enhancer, Energy, efficient and durable material rice technologies(GEM) facility, 538 women rice parboilers including 10 from Gaya in Niger, were trained on processing and adding value to locally produced rice. Over a period of two months, these women households learned skills on rice parboiling and value addition as well as the management of the GEM parboiling facility. The training alone resulted in 8 tonnes of quality parboiled rice which is already attracting consumers within and outside the Malanville community. As part of the IP process, 12 youths (10 male and 2 female) are being facilitated to learn various skills on rice processing and adding value and operation of equipment and farming tools. The formal opening was attended by the IITA/SARD-SC Coordinator, Dr Chrys Akem. He remarked that in general, the SARD-SC project has challenges in effectively addressing gender equity – active involvement of women in project activities. The deployment of the GEM rice parboiler in the Malanville IP has fully demonstrated that pairing gender sensitive technological innovation with institutional change, can significantly bring about gender mainstreaming in agricultural productivity programs and projects. 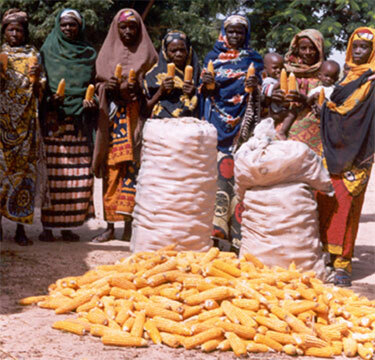 To date, over 1000 women households have been reached through the GEM technology and innovations in two IPs in Benin. The GEM is being rolled out in combination with enhanced packaging and branding of locally produced rice to attract urban rice consuming households and contribute to raising incomes of women and employment opportunities for youth in the rural economy. Already, Nasarawa in Nigeria and Gaya in Niger in consultation with their respective research institutes, have requested for the GEM technology and innovation and these will be deployed in Nigeria and later in Niger.